Hot, strong tea fuels the fishermen and farmers of Scotland. 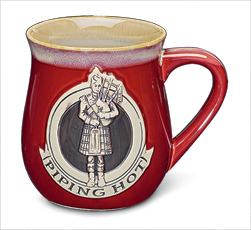 Take your tea or other hot beverage in this hardy stoneware mug, featuring a bagpiper and the legend "Piping Hot". Holds 16 oz. to the brim; microwave and dishwasher safe. Imported from UK. Piping hot mug is hot! A beautiful mug that I used for a gift to a piper friend in the Rockford, IL pipe band. Very nice mug. Being given as a present. Great large-sized mug, light-weight and can be microwaved and put in the dishwasher! Cute saying and picture. I ordered 5 and gave them as Christmas gifts and everyone loved them! I ordered 2 weeks before Christmas but they didn't arrive until the day AFTER Christmas. That was my only disappointment. I bought 2 of these mugs. One was a gift for my bagpipe teacher. These are a beautiful, well made mug. They hold nearly 16 Oz's of liquid. Considering the cost of the mugs I purchased I was very disappointed with the quality of the craftsmanship. The hand painting was not well done and cheapened the appearance of the mug. It is a shame because the shape and color of the mug itself is quite attractive. I would not recommend purchasing this product.. Owner Response:Thank you for your review, Marianne. We're always happy to assist with an exchange or return if any of our products do not meet your expectations; please give us a call at 800-207-4256 if we can help.